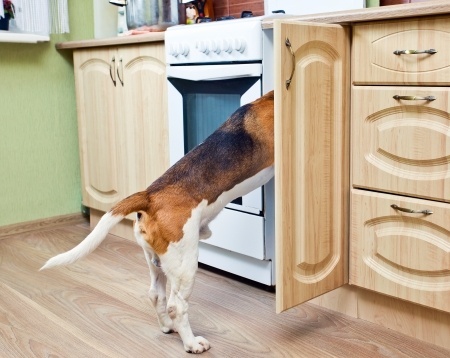 Yes, you can feed the pooch in the kitchen without letting the whole place go to the dogs. Hey! You're not the only one chowing down in the kitchen. That doesn't mean the whole room has to go to the dogs, however. How can you and the pets peacefully co-exist in this busy heart of the home? Easy! If you organize separate, defined areas for each, that is. Here's how to create a kitchen pet feeding center. Create a kitchen pet feeding center out of the way of foot traffic. The idea is to provide pets a safe and convenient munching spot where food and water bowls are not likely to be kicked over by busy feet. Keep pet food out of sight, but within easy reach come chow time. I use a lower corner cabinet just above the cat's food and water dish. So in one quick motion I can scoop both quickly out of sight - or fill them up and put them out at chow time. The key is to keep bowls and food both handy and out of sight when not in use.